Oftentimes when you take a tour of a mobile home or camper, you'll come across rooms that overlap, beds that come down from the ceiling, and a kitchen the size of a bathroom. That's just part of the lifestyle, though. Those who enjoy minimalism likely don't want giant rooms with unnecessary space - and more nooks and crannies to clean. 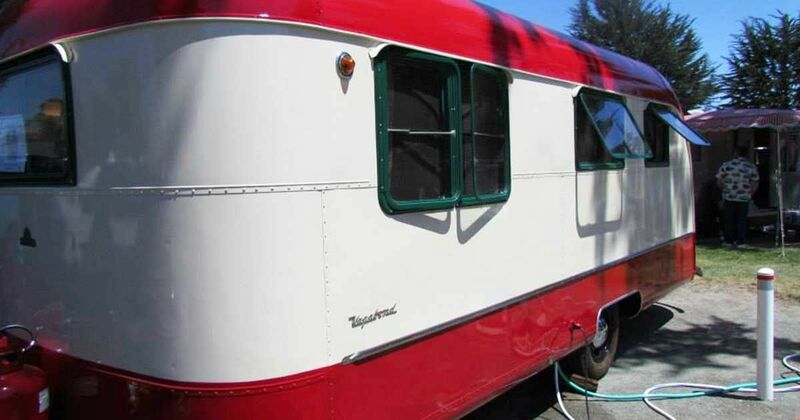 This Vagabond camper from 1950 is everything that a minimalist could want and need. The cozy interior, which may have seen a few renovations over the decades, is perfect for a couple or a small family. The full-service kitchen and spacious eating area make this trailer a true dream. Below is a view of the dining area and kitchen. Check out that old-school refrigerator! There's plenty of space in the kitchen to cook. Any chef on a camper would be ecstatic to see an oven with four burners. Booth style seating provides space for the whole family. Here's a look at the dining table, which has a picnic theme to it. Opposite the dining area is the bedroom. A sizable bed sits right underneath a couple of windows. Here's another shot of the Vagabond's exterior. What did you think?